Terry Farrell’s contract was up on DS-9 and she was leaving the show. The story going around was that she did not wish to leave but the producers would not grant her contract requests. As the visual effects supervisor, I was on the DS-9 set to oversee the effects needed for her last scenes on the series. Terry was not very happy and was giving tearful goodbye hugs to her production crewmates. I have seen actors who were really obnoxious and uncooperative when they didn’t get what they wanted so I was watching Terry with interest as the day unfolded. For every shot when called, she dried her tears, went on set, became her character, Dax, and delivered the best performances she could. She did not give an attitude, whine or make excuses. She did her job. 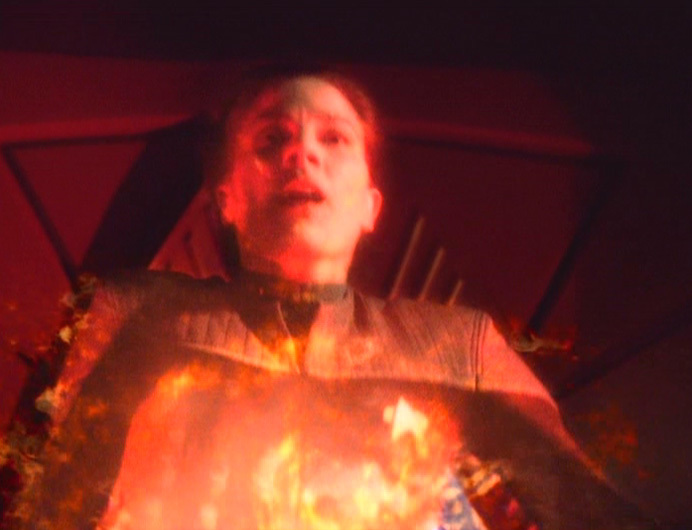 To give Terry an exit from the series, the DS-9 writers had bad boy Gul Dukat kill Jadzia Dax in the episode called ‘Tears of the Prophets’. 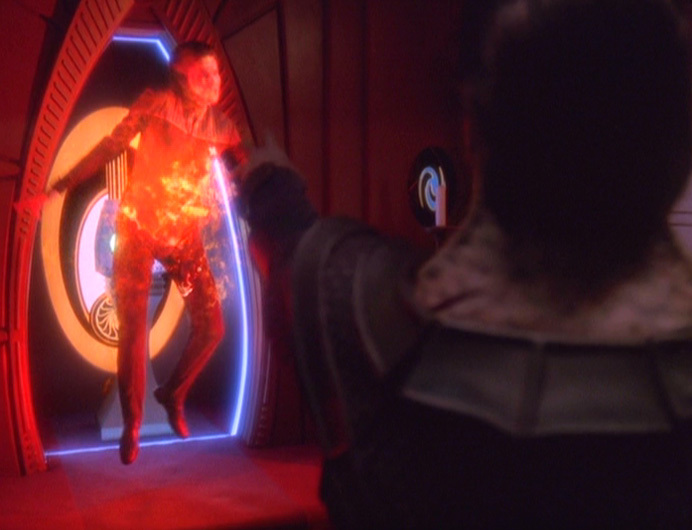 Dukat, possessed by the Pah-wraiths, uses an energy force to lift Dax off the ground then kill her. To accomplish this, Terry would have to wear a special flying harness which wrapped around her hips. Unfortunately the rig, made of thick leather and straps, was very uncomfortable and did nothing to flatter Terry’s figure. In fact … she was horrified at how she looked. Terry came up to me with a look of desperation on her face; the harness around her hips made her look huge! Was there anything I could do to make her look better in her last shots? I was so impressed with her qualities of character and professionalism that I assured her that I would do what I could to help her look good in the final shots. With that she appeared relieved and we went on to do the final death scene. When we got the footage into the digital compositing bay we began looking at techniques and options to see what we could do to help Terry regain her figure. Since we were on a budget for a limited effect for the death scene, we had to squeak this in somehow. We decided to cover Terry’s torso and hips with effects elements rather then try to rotoscope or otherwise distort her filmed image frame by frame which would have cost a lot in man-hours and bay time. Luckily, we had some resources. Over the years of production, we had amassed a collection of visual effects footage elements like fire, smoke and liquid nitrogen. We began experimenting with the elements over Terry’s footage to see what worked. We decided to use licks of liquid nitrogen vapor fluttering out from the edge of the body and hiding her rig-thickened profile. While not a perfect fix, we did it within the budget we had. Months later at the DS-9 wrap party, Terry came over and gave me a warm thank you for making her look good. I told her how impressed I was with the way she handled herself in that situation so it was a pleasure to help her. This was really a kind thing to do for her within the confines of your job. It is nice to see that neither professionalism nor chivalry is totally dead in Hollywood (at least while you were there). Thank you for your kind words. All were fortunate that we could do this and stay within budget. This helped the show, too. We were able to do an effective visual for Terry’s death scene and keep her from looking awkward. I sure enjoy reading about the things one doesn’t usually hear about, thanks for sharing this, I alwys enjoying knowing what were the reasons for the choices made… sure looks great!!! I’m glad you guys liked the story. We focus so much on the gee-whiz, cool effects that it is easy to forget that ultimately our jobs are really about people dealing with people. It was nice to share a good “people story” within the effects world. I also enjoyed your “The Real Sample Reels” article. Good stuff, thanks again. Too funny the stuff send in. Some folk’s thinking process (of lack thereof) just confounds me at times. I may want to call you, so have the basics, your name and phone number on the label and at the end of the reel. Entertain me with appropriate music selections, They will help almost any reel</B?. They will help almost any reel. If you use sound effects, do them well or they will detract from the good imagery. Dug the Motion Control article about “The Beast” as well. Would have liked to have seen the rest of the pages though. I am just about finished updating my TOS.5 ENTERPRISE to TOS.5.2. I ported it from modo to LightWave finally and redid all the lighting and surfacing, and added a few more subtle details (dorsal pylon (aka neck) docking ports for one). There are some updated shots (orthos and scenography) on my website so far, but I am still working of updating the 25 pic “fly-around” section, along with the footage of her on my reel. I may want to call you, so have the basics, your name and phone number on the label and at the end of the reel. Entertain me with appropriate music selections, They will help almost any reel. They will help almost any reel. If you use sound effects, do them well or they will detract from the good imagery. Not to get off subject, was just enjoying pokin’ around your site. So much enjoyable VFX stuff there, as well as the aforementioned stuff. Thank you for your comments and for pointing out the article error and broken link. I will get those fixed. I’m glad you like the web site. Are there things you would like to see added to the site or topics to cover on the blog? To tell the truth I am somewhat awed by Doug and John’s blogs. Where do they get all that stuff? While I know I’m not supposed to compare self to others, much of my old work doesn’t feel exciting enough to post. I like to include visuals with articles to make them more interesting. So, that being said, any suggestions would be appreciated. Well David, I dig anything you choose to put up, eh. And while I enjoy all your guys’ blogs, they are all quite unique in what they present, IMO, just like the three unique guys you three are. From Doug, we get a very board spectrum of stuff, pro-based, and personal Trek fan-based, and Doug puts a lot of time in to it. Quite frankly, it was good to see him cut it back to just Sunday posts as that’s a LOT of work. He needs a life too! For John (whom I just got off the phone with BTW), he’s great for his pro take on things design-wise, and his own collectibles interests, which we share to a tee. So much he calls us separated at birth! And with yours, being an overall VFX aficionado from Méliès to today, I enjoy your old school presentations of stuff and style. I love seeing all the early days photos on your site and would love to hear anything at all more about those, esp.Equinox stuff, as I loved that film. But any back-story to any or all those great shots would be great, I enjoyed that LA Times article on you as a “Teen In Action” as well. I had to open it up in Photoshop and blow it up to read it. I also enjoyed picking up and following your reference to Harry Walton’s VFXMasters.com site. Oh that cool scrap-book o his! My heroes on the beach! Can’t figure why none of your are in swim-suits on the beach though, LOL. Would love to hear some of the stories beind those photos. Also, I’d be interested in hearing about your choices and whys thereof of your career path. You knew and know many of the main guys who went on to form ILM, any reason you did not go along with them? You had other plans in mind for yourself? Your own business obviously. I’d like to hear more about how you went about setting that up, and establishing yourself as a dependable and working business in the Industry. And what were your thoughts and feelings about giving that long established business up to join the Star Trek crew. That had to be a decision you mulled over for a time or two, eh. WOW! thank you for taking the time to respond with such depth! I will take this and get to work! When we were all at that beach, I think it was David Allen who commented that if someone dropped a bomb on us that day it set visual effects back for years. Also, I mentioned this a post or two back as to reels, how’s the production of mine faring in your opinion, if ya get a few minutes to look at it. The TWA was small less than 2 ft. The AA was huge, about 6 ft long and big wing spread. My Pops designs and builds 1/4-scale R/C aircraft (mostly WWII fighter and bombers), and we’ve had some big birds in his shop, up to 16 foot wing-spans! Wow! 16 foot wing span?!!? I would love to see photos! What was the plane; a B17 or B25 or something like that? I remember vividly the day that Mr. Stipes related this story to our class. It was to illustrate a point about professional behavior and always making an extra effort to be kind because you never know when it will pay off. I like this story for the simply fact that it illustrates the positive aspect of professional courtesy and puts a real human touch on a show that I really enjoyed. …and always making an extra effort to be kind because you never know when it will pay off. For myself, I feel the reward is in the act itself, not for any potential pay-off down the line. Nice should be bereft of any agenda other than that of just being nice, IMO. In my experience, that’s all one need attend to (and getting good at your skills and being assertive while not being pushy), the rest naturally takes care of itself, as that is the type of energy you carry within you and thus share with other, and thus will attract back. Win-win for all concerned. Just be of kind and of good service. Pretty simple in the end. Just my experience and two-cents. I agree with you that an act of kindness is its own reward. While it may or may not come back to you, I think helping others is the better approach to take in life. To be clear, I didn’t share the story about Terry as a brag or ego boost but to show some behind-the-scenes events and motivations that affect how shots turn out. Terry was exceptionally professional, kind and undemanding and we, in turn could help her without hurting production in any way. One of the points I share with students is that one’s behavior toward others can have a dramatic impact upon your success. Especially any bad behavior! I have observed that bad behavior can take on a life of its own with the person who was wronged going out of their way to get even or sabotaging your job opportunities at every turn. For example, I know a film person who “screwed over” a producer. This producer knew a LOT of people and made it his business to stop every job this film person applied for. He was good at it, too. The film person is in another career now. So I agree with you both, Tyler and deg, kindness is the better policy. For me being helpful and kind has created a better life and career. But let’s not forget that honestly, reliability and quality are part of this picture, too. So just being kindly is not enough. It is a part of the qualities of character that make you a true professional and maybe a successful professional. Be honest no matter what. Always be a straight-shooter. Never be a “yes” person. Keep the line of communication clear and truthful no matter what. I for one never want anyone to fudge the truth concerning dead-lines. I want it straight always, so I can adjust my production schedule accordingly if needed. I’d rather hear what may not sound the best at that moment, rather than be “yes” BS’ed to, that I will end up having to pay for later. Give it to me straight. And that’s waht I do as well. And screwing folks over and revenge schemes, sadly, some peeps do act that way out of ego-driven fear, but that is no way to live a quality life, for yourself, or in regard to being of service to others. Simply put: You reap what you sow, eh. Law of the Universe.